From a public relations perspective, it was a good plan: round up a handful of journalists, cram them in 4G LTE connected cars, and showcase OnStar's new network by using it to host teleconference interviews from the beach. A good plan, but one still subject to the follies of network connectivity. After spending several hours connected to GM's "Connected by OnStar 4G LTE" fleet of 2015 sedans, I can unequivocally say it's the best LTE experience I've ever had at 70 miles per hour -- but it's far from perfect. I'll admit, when General Motors invited me to test drive its new 4G LTE-equipped Buick LaCrosse, I wasn't expecting much. I've used mobile hotspots and LTE dongles on the go before and it's almost always a miserable experience: lightning fast speeds for very brief periods of time. Phil Abram, my host and GM's chief infotainment officer, hears my complaints and tries to explain what makes the LaCrosse's OnStar system different. "Are there going to be times when you hit a deadspot?" he asks. "Yeah, but do we feel this is superior to brought-in devices? Absolutely." He's referring to the LTE hotspot in my backpack, explaining that devices literally "brought-in" to cars struggle with the vehicle's metal frame. "Our antenna is on the roof," he says. "Having that height is an important element." He also says the car's battery gives the radio a lot more oomph than the average LTE dongle. My prejudice for mobile data dissolved as we hit freeway traffic -- not only did a quick speed test boast 16.76 Mbps downloads and 4.86 Mbps uploads, but the car flaunted enough bandwidth for me to simultaneously stream Netflix and Twitch while downloading a game from Steam. Another passenger in the car was streaming ESPN without a stutter. Earlier, Abram told me that his children were starting to become frustrated with their mother's WiFi-free vehicle, and I can see why: if OnStar's 4G LTE connectivity could handle my absurd test load then the demands of a pair of iPad-equipped kids would be, well, child's play. Sadly, GM's wonderland of mobile connectivity didn't last. When we parked at Moss Beach for a pit stop and a series of pre-scheduled video interviews, the car's blazing LTE speeds plummeted. As event staff struggled to connect us to Google Hangouts with Detroit executives, I pinged my testing app once again. The struggling connection could only manage a paltry 0.2 mbps download. "It was working fine yesterday," I overheard a frustrated GM employee mumble. "We tested it." Guests and event staff alike couldn't agree on what was causing the problem. 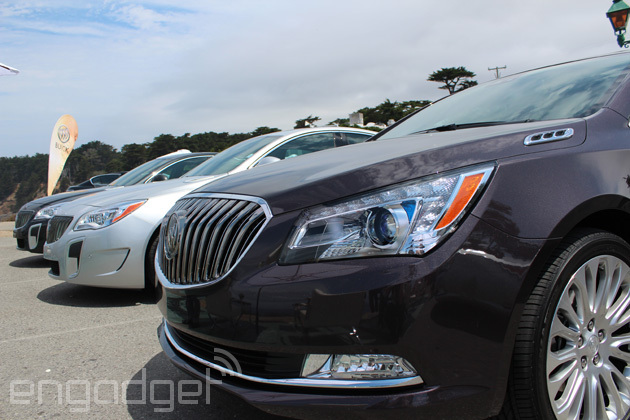 There were half a dozen LTE cars at the event -- were the airwaves too crowded? Perhaps AT&T's network was just having an off day. Eventually, we limped through the planned video interviews (muddled voices and garbled video, included) and got back on the road. Within a few miles, our LaCrosse's laudable LTE performance returned at full strength -- lending me enough bandwidth to finish downloading Half Life 2: Deathmatch and give myself a headache by playing a competitive multiplayer game on the freeway. The game stuttered occasionally (its ping averaged about 200), but I forgave it for the sake of the novelty. OnStar's 4G LTE connection isn't perfect, but my time with it was reliable, fast and impressive. Sure, it floundered for awhile as we were parked on the beach and my Twitch stream did hang once or twice on the drive to California's coast, but it handily outperformed my expectations on average. Still, it is the same AT&T LTE network I already have a love / hate relationship with, and that infrastructure is going to buckle every now and again -- no matter where GM mounts its cellular antenna. Is it worth it? Well, if your heart is set on a Buick (or any of the other 30 GM cars that will come with the tech in 2015), you won't have to decide right away. Abram explained that every model capable of having an OnStar package will include the hardware as a standard -- whether the customer wants to use it or not. He also told me that OnStar is trying to distance itself from the idea that it's a subscription service: buyers of these cars will be able to access certain features for free (specifically, a RemoteLink app that lets you start your car from your smartphone), and non-subscribers will be able to purchase data piecemeal: $5 for a day of service, for instance, without "signing up" for a recurring service. As for me? I'm just not in the market for a new car -- but if my next ride came with internet connectivity as a stock option, well, I certainly wouldn't balk at it.